We have had a great beginning to the school year! Many, many new faces and families have been a true blessing! One thing that is different this year is that our Preschool and our School are both starting at the same time. Thus, drop off is occurring at the same time. For the first few days many families have been arriving early and walking their children in. This is of course wonderful! But as we now begin to settle into our routine, we want to establish our Drop Off procedure. On Wednesday, 8/27, we will begin our new Drop Off procedure to ensure first the safety of our children and secondly that everyone can get through in a timely manner. You can refer to the rather cute map above as a guide. On Wednesday, Mr. Canney and some of our Junior and Senior students will be directing traffic for Drop Off so that everyone knows where to go. The parking lot on the far right of the map (the end of our lot) is reserved for parents who want to park and walk their child in. This is NOT a drive through zone, for the safety of the children exiting their cars and walking to the breeze-way. If you want to park, please use the drive farthest from the school to access this lot or use the rear entrance from McConnell Springs Road. 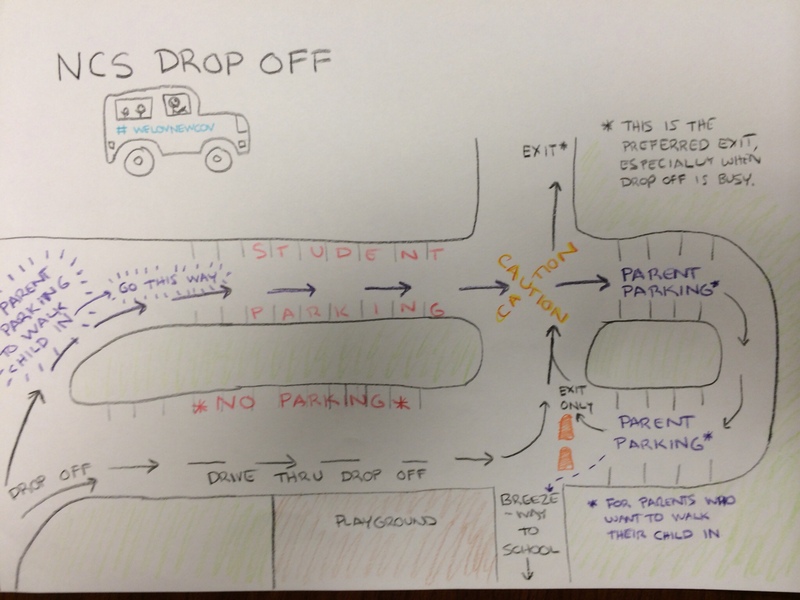 The drive closet to the school is for parents NOT seeking to park, but rather dropping their children off and driving away. There is NO parking in this area! When Drop Off is at its busiest, the rear exit going to McConnell Springs Road is the easiest and most considerate way to leave. ALL DROP OFFS AND WALK INS MUST OCCUR AT THE BACK BREEZE WAY. There is to be NO entering either building from the front. THIS IS VERY IMPORTANT for us to monitor the flow of your children. The staff who is on duty for Drop Off is stationed at the back breeze way. From the front, there is no staff present and some doors may be locked. We are looking forward to a great Drop Off tomorrow! 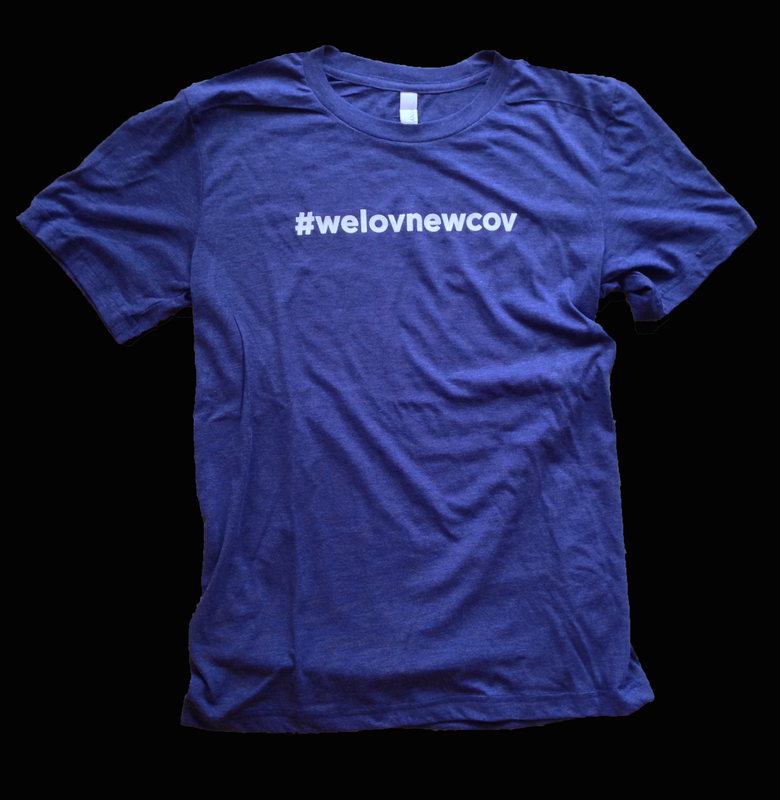 You have the chance to order a super cool #welovnewcov shirt! Shirts will be printed on August 27, so be sure to place your order soon! Order one (or more) using the link below. The sizing goes from Youth Small to Adult Double Extra Large, so get one for everyone is the family! Cost is only $10 each and any proceeds go to NCS! You can see a picture of them at the link as well. Please make checks payable to NCS and put “shirts” in the for line. You can pay for your shirts when you pick them up. Show some New Cov Love! Welcome Back! It is such a joy to have the halls full again. We are off to a great start! Uniform clothing items are available for you to look through in the gym through tomorrow. Please help yourself! Starting tomorrow, we will be going back to Friday Folders. Please look for this in your child’s backpack. This will include graded work and important announcements. Upper School students will not receive a folder. Information will be sent via email and copies will be available in the office. If you have a student driver, please be sure to complete a permission form. We also need a copy of the student’s insurance card. Tomorrow, Friday, Aug 22nd is a dress down day! Jeans will be allowed. Please wear CAVS, NCS or blue shirts. 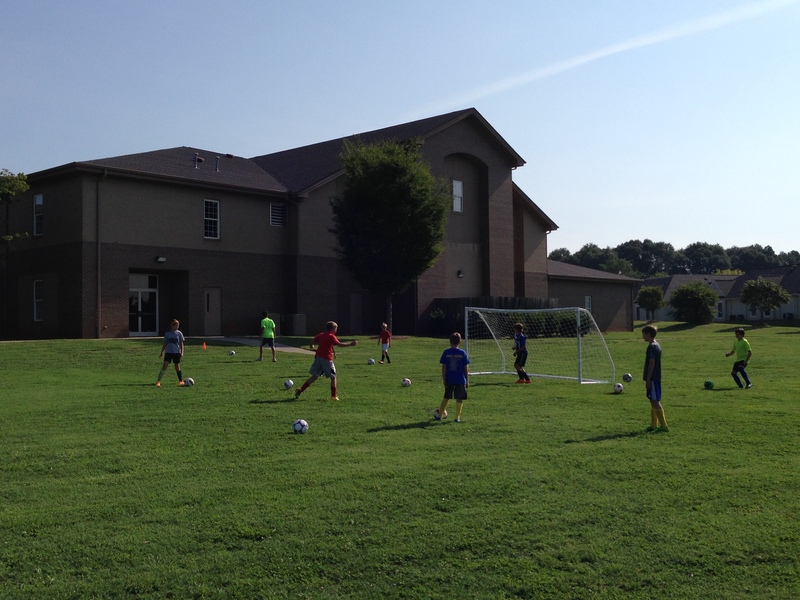 Our Under 14 soccer team had a great first practice Saturday! We will have 15 players on our futbol team roaming the pitch this season. Manning the sidelines will be Coach Rob Wright, an NCS parent of 7th grader Elliot Wright. Go Cavaliers! We know you will make us proud this season! 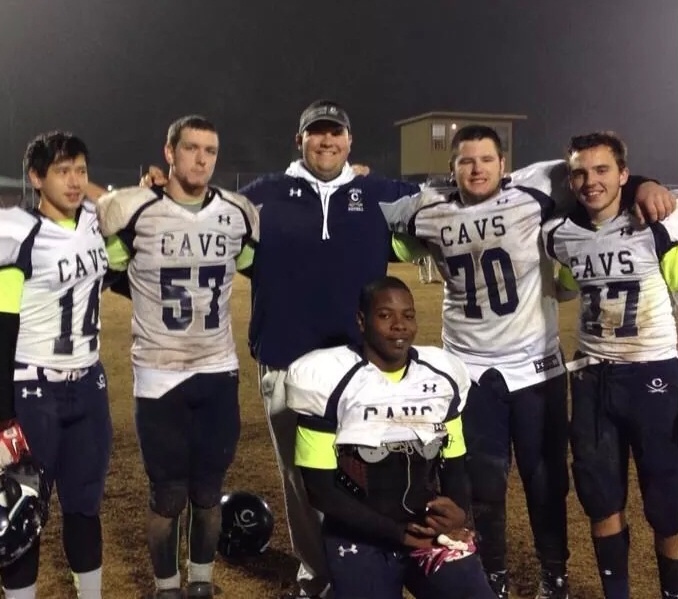 Coach McClain (center) pictured with some of his players, including NCS alumni Bruce Elder (second from left) and Thomas Settle (far right). New Covenant School is excited to announce that it has hired Mr. Dalton McClain as the Physical Education teacher and Athletic Director for the 2014-2015 school year. Mr. McClain is an assistant varsity coach for the Anderson Cavaliers football team and a former multi-sport stand out at Belton-Honea Path High School. For New Covenant School, Coach McClain will oversee the PE instruction for students in Kindergarten through 9th grade. Additionally, he will fill the role of Athletic Director as New Covenant School looks to continue to grow its athletic programs and take advantage of its membership in the South Carolina Independent Schools Athletic Association (SCISAA). Welcome aboard Coach McClain! Go Cavaliers! Our search for a new Spanish teacher has lead us back to our former Spanish teacher. 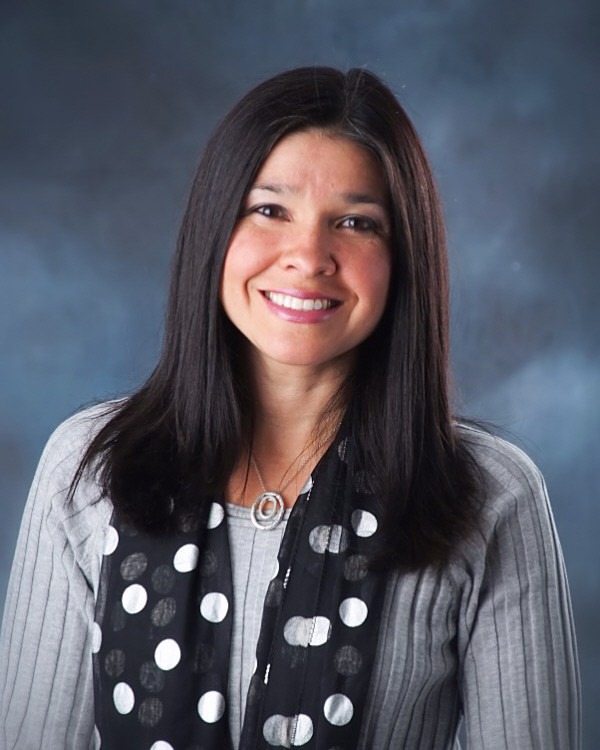 =) Mrs. Kelly Wickiser has agreed to return as our High School Spanish teacher! 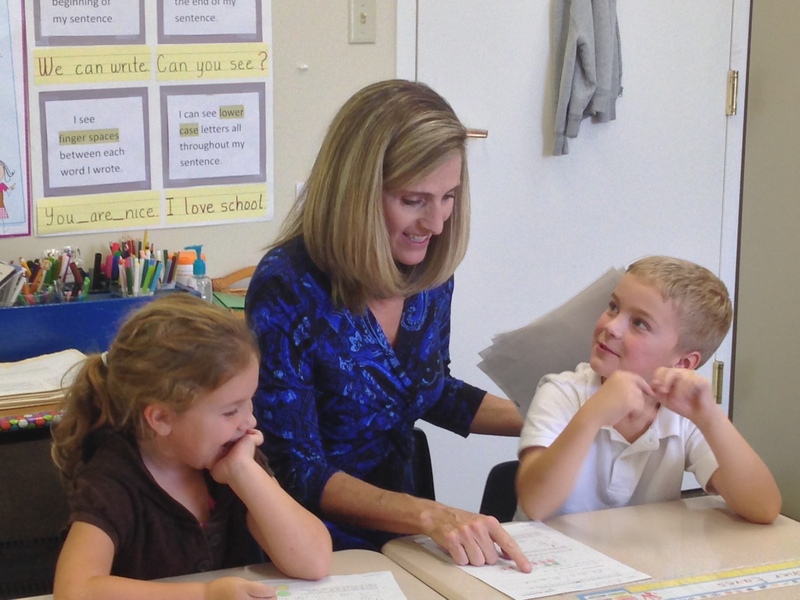 We are overjoyed that she is able to come back and continue to offer excellent instruction to our students. Please be sure to welcome Mrs. Wickiser back the next time you see her, although it feels like she never left! Uniform Swap – Free School Clothes! 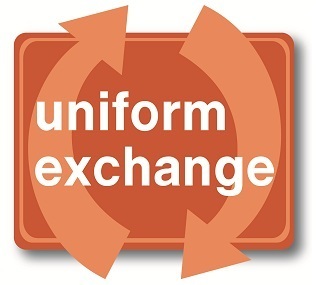 We will have a “Uniform Swap” this Monday night at Orientation! I already have a collection of uniform clothes to share with all who need them. If you have uniform clothes that you would like to donate, please leave them in my classroom before Monday. I will have them available to look through and TAKE on Monday night. They will be on a table in the sanctuary organized as best as possible! This is just a service the school would like to offer this year. I know many of you have things too small that are in good shape that you might like to pass on to another family who might be able to use them. You are welcome to come a little early for Orientation to look through the clothes and take what fits! If you have any questions, don’t hesitate to call! Are you in interested in partnering with New Covenant School to help provide a Christian education to those who are unable to afford it? Then please go to our Support page to find out how as little as $10 a week can make a huge difference in the life of a child. Today, New Covenant School Headmaster Joe Canney had the privilege of meeting with Larry K. Watt the Executive Director of the South Carolina Independent School Association (SCISA) as NCS continues to explore membership and accreditation from SCISA. This initial meeting and tour went very well and Mr. Watt was impressed by New Covenant School’s excellent facilities, staff, and curriculum. 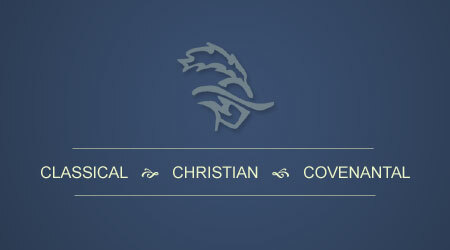 SCISA offers a variety of programs that would be a benefit to New Covenant School. These include opportunities for professional development, academic showcases, and athletic competitions. We will keep you updated as the school continues in this process. New Covenant School is seeking a Physical Education teacher for the 2014-2015 school year. If you are interested in this teaching position, please familiarize yourself with our school and classical, Christian education by reading the information on our website. This position is a part time teaching position for five afternoons a week at a total of 10 hours per week. Pay is based off of qualifications and experience. 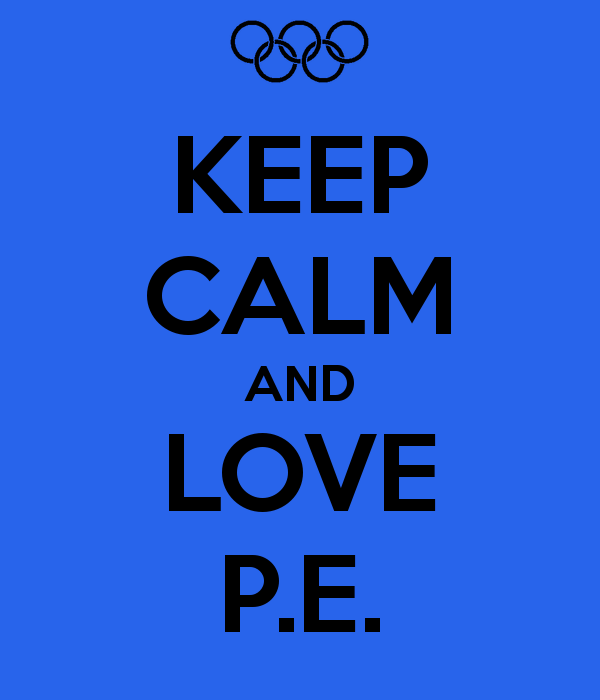 The PE teacher is responsible for teaching classes to Kindergarten through High School age students. If you are in interested in finding out more information or in applying, please call Mr. Joe Canney, our Headmaster at 864.224.5675 or email him at canney@ncchurch.net.